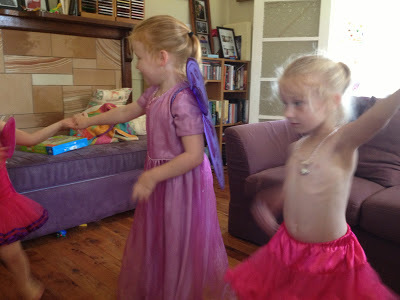 I have been promising my Muddy Pixie for a while now that she can have one of her ‘best friends’ over for a play date. Finally I got myself into gear and organised it. It was set to be a great day, she bought her bike and her swimmers and her mutual love of craft. It didn’t take long for things to turn pear-shaped. You see, what I hadn’t counted on was that my Muddy Organiser also considers this little girl her friend and they would start fighting for her attention, for who got to ride their bike next to her, or sit next to her for morning tea and lunch and who got her to play their game of choice. I tried reasoning with both of my Muddy girls, I pleaded with my Muddy Organiser to just give the Pixie and her friend a little bit of time (even a few minutes), but it didn’t stop the tears and the distress. By the end of the day I was exhausted from keeping the peace, dancing then craft seemed to heal all wounds and keep us occupied for a good 90 minutes before we changed activities and then the day was over. I am really not sure how to broach the play date in the future, it’s not a problem we’ve had before when we’ve had friends over to play. Maybe I try to lessen the numbers and organise activities elsewhere for one or the other, or maybe I just have to let them at it and they’ll sort it out. How do you handle this kind of thing? Or is it something that only happens in our house? 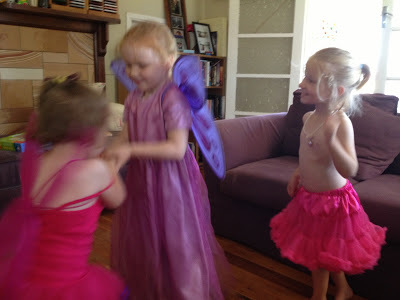 This entry was posted in Mother Angst, Muddy Organiser, Muddy Pixie, Sisters on January 21, 2013 by nat. Ah no, not just your house! Play dates can be fraught with difficulties. I have even had to referee when a friend of Mr 9s decided to play Polly Pockets with Miss 6 in her room one time!!! Although I cringe as I write this, it often works better if mine have a friend each at the same time. Busy but we avoid the 3s a crowd syndrome and they often end up all playing together. Would it be crazy to let them have a friend each over? I have no idea about this kind of thing yet, but just doing the maths, maybe it’s a numbers game… or maybe then they’d all just gang up and fight anyway. Who knows how their little inner politics works. It DOES sound exhausting though.